"Two Funerals" / "The Johnny Karate Super Awesome Musical Explosion Show"
"The Johnny Karate Super Awesome Musical Explosion Show"
Look, these are two absolutely stellar episodes of Parks And Recreation. “The Johnny Karate Super Awesome Musical Explosion Show” wins for sheer format-busting ambition, while “Two Funerals” takes the edge for heart, emotion, and having Bill damn Murray show up as the smirking corpse of Mayor Gunderson. When it comes time to look back and write the story of season seven—which, really, no time like the present, I guess, even if there’s still one double-length episode left to go—the best place to start is “Donna And Joe,” because that was the pivot point of the season. 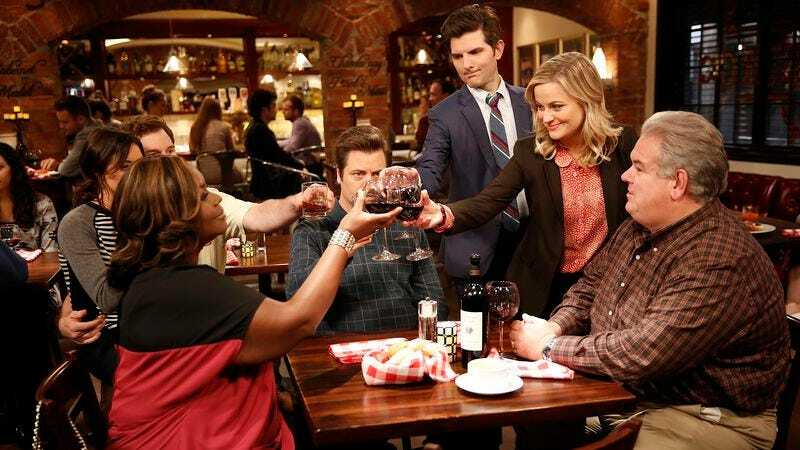 The Gryzzl arc was, with the transcendent exception of “Leslie And Ron,” one last bit of late-period Parks And Recreation wheel-spinning, a plot-heavy saga that asked the audience to care more about the minutiae of land acquisition than is really sensible for a modern sitcom. I don’t want to write off those five non-“Leslie And Ron” episodes, because there’s plenty of good stuff in there, but they felt like the show taking one final deep breath before the farewells began. Everything since “Donna And Joe” has been a goodbye episode, packed with callbacks, cameos, and, well, conclusions. 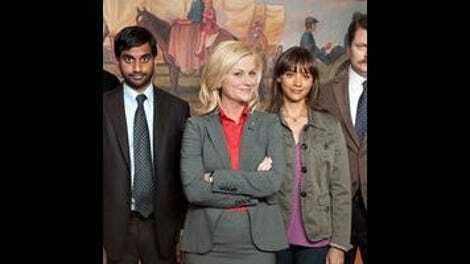 Maybe Parks And Recreation wasn’t built to run forever. But it sure was built to bow out gracefully, and both of tonight’s episodes fit that pattern beautifully. “The Johnny Karate Super Awesome Musical Explosion Show” is a giddy bit of fun, allowing Parks And Recreation to finally get in on some of the high-concept craziness that so defined its former stablemates 30 Rock and Community. The show’s use of the mockumentary format locks it into a far more rigid narrative aesthetic—unless you just say “screw it” and shoot a whole damn episode on Apple products, I guess—but the conceit of building an entire episode as Andy’s last hurrah on public access lets the show try a far brighter, more hyperactive mode of storytelling. Which, as it turns out, makes it the perfect showcase for Andy’s worldview, one that rides a line here between adorably innocent and dangerously reckless, with more than a hint of unnecessarily self-absorbed. This is Andy in full-on big dumb dog mode, and there are times when this gets grating; at some point, Andy apparently started hating Garry more than everyone else combined, and his destruction of Ron’s beautiful case isn’t really offset by Ron’s refusal to hug. There are enough awkward little moments in “The Johnny Karate Super Awesome Musical Explosion Show”—John Cena is decent, I suppose, but he’s no Detlef Schrempf—to knock this episode off the show’s absolute top tier. But it’s easy to ignore the occasional wonkiness when so many other little details are spot-on, and the fake ads that bookend each commercial break are all things of beauty, from Ron’s exquisitely long pause to Verizon-Exxon-Chipotle’s proud announcement that they remain one of America’s eight companies. There’s some fantastic escalation there, as the episode takes its commercials from the local and shoddy—well, Ron wouldn’t think of it as shoddy, just straightforward—to the epically absurd. Throw in all the random bits of business on display in the show itself, with Donna having a particularly strong showing as the chief and the blues-y singer of “Kung Fu Fighting,” and there’s more than enough here to make this a worthy link in Parks And Recreation’s farewell chain. Still, what really elevates this episode comes at the end, as Andy rushes off to console a conflicted April. As caricatured and occasionally jerkish as Andy might be, his love for April consistently brings out the best in him; he might not be able to manage much more than inspired trainwreck in any other walk of life, but he’s the perfect husband for April. His message too is an important one, as Andy makes it clear that he is happy to walk away from the best job he’s ever had so that the love of his life can find her own happiness. It’s a scene that had me thinking a lot about what makes a genuinely happy ending, a question that carries over in a still bigger way in “Two Funerals.” With that scene, Parks And Recreation makes the crucial point that a happy ending need not be getting everything a person wants, particularly when that person has elected to share his or her life with someone else. But nor is happiness in relationships a zero-sum game: Andy knows there will always be other awesome jobs, and he knows he will be able to appreciate that awesomeness as long as April is with him. The happy ending doesn’t lie in Parks And Recreation contorting itself to give the characters everything they could ever want. Rather, the trick is in getting the characters to realize what specific things they need to be happy, and to give them the opportunity to go after it. Take Tom’s proposal to Lucy. Tom—who had been on a trip to New York these past three episodes, who knew?—is absolutely right when he says he has no idea why Lucy is still with him, because I couldn’t really tell you either. The character still doesn’t really have a defined personality beyond what Natalie Morales’ considerable charms can convey, so this means the Tom story ends up being less about his figuring out what Lucy wants—I mean, he tells us, but we just kind of have to take his word for it—and more about Tom recognizing that he should look beyond his own constant selfishness. He’s still someone whose idea of a gift for a friend is shoes that are clearly for him, but he cares about Lucy enough to put his own worst instincts to one side, at least temporarily. There’s frequently discussion of whether characters on shows “earn” their happy endings, and there are situations where that question makes sense. In Tom’s case, his character development stalled out a while back, because to develop him any further would have been to rob him of what Aziz Ansari made funny about the character in the first place. So the happy ending is only earned to the extent that you like Tom, and I suspect there’s a great degree of variance there. But in this narrow, episode-specific context, at least what happens is the direct result of people thinking of others: Tom thinking of Lucy, Leslie thinking of Tom, and Jean-Ralphio thinking of … nah, Jean-Ralphio is definitely still thinking of Jean-Ralphio. What’s fun is that these good intentions need not always align. April has her latest moment of uncharacteristic niceness—which are so frequent that it’s hard to consider them “uncharacteristic,” but she did convulse in pain, so I’ll allow it—when she tells Ben he should put Ice Town behind him forever by naming himself mayor. It’s a kind thought, one born of April wanting Ben to see himself in the same positive way that she does (even if she would never admit to it). But Ben knows himself well enough to recognize that he doesn’t actually need that kind of validation, that what he really needs is to own his failure and recognize how it has shaped so many of his subsequent successes. Then, of course, we get Mayor Garry Gergich, which just about completes Parks And Recreation’s concerted effort to be nicer to Garry now that the show is ending and nothing matters anymore. But hey, if any character in television history has earned a damn litter carrying him to his victory balloon, it’s Mayor Garry Gergich. But when I think about “Two Funerals,” what I keep coming back to—other than Bill damn Murray, obviously—is Ron’s story. Informed by the same heartbreak and resistance to change that made “Leslie And Ron” so brilliant, Ron’s subplot is a nice reminder that someone will have to be left behind as the characters go on to bigger and better things, and it was always going to be Ron. Having him end up in Typhoon’s barber chair and then immediately bonding with the man over his distaste for Europe and bicycles is just so damn inspired. Ron doesn’t have to change—though I’m going to guess he will, however incrementally, after a few months in Typhoon’s chair—but there is common ground with the unfamiliar just waiting to be found, if he will allow himself to. Parks And Recreation, as is so often the case, just finds the perfect way to balance that lesson between the poignant and the hilarious. One more week to go. I’m really not ready. Sorry for the late review, everyone. I guess it was too much to hope I’d finish off the season without one of these. I’ll try to be prompt with next week’s finale, though. So many great cameos tonight: Paul Rudd as Bobby Newport, Nick Kroll as the Douche, unnervingly clean-shaven Sam Elliott as the awful Ron Dunn, and not one, not two, but all three Sapersteins. My favorite of the bunch might actually be Jenny Slate as Mona Lisa, just because she’s all that is awful about her family distilled into one psychotic singularity of destruction. Good stuff. “Put it in your body, or you’re a nerd!” God, I want a Paunch Burger so bad right now. Look, I’m glad and all that they finally got Bill Murray to play Mayor Gunderson. But I had always kind of hoped he would turn out to be Joe Morgan.